Armagh Carpet.com is the holding page of the established home carpet department at Dalzells of Markethill located between the towns of Armagh, Newry and Portadown. Through more than 50 years of trading as an independent, family run carpet retailer in N. Ireland, we are proud to offer a truly extensive range of flooring including Carpet, Vinyl and Laminate Flooring in addition to a wide selection of specialist Commercial Floorings with a Highly Professional Fitting Service across Northern Ireland and Counties Louth, Monaghan and Dublin in Ireland. We have a wealth of experience in flooring and our carpet fitters are highly professional, so for great value and unbeatable aftercare on your home's next carpet or commercial flooring requirements be sure to put both Armagh Carpet.com and Dalzell’s of Markethill on your weekend’s to-do list. Armagh Carpet.com is currently under development, but we will be bringing you exciting deals and promotions in the near future. 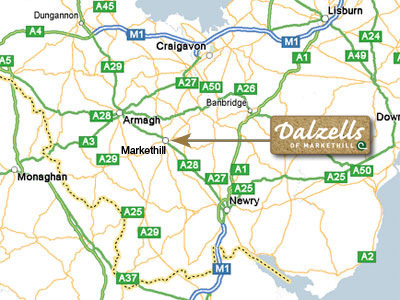 The website will feature Dalzell’s of Markethill’s extensive range of floorings from a range of top brands that include Ulster Carpets, Furlong Flooring, K J Flannagan Flooring, Phloor and Mercado Carpets & Vinyl to name but a few. While the site will feature a wide range of carpets we recommend that you visit us in-store to fully appreciate your many choices, gain expert advice and the best deal just 11 miles from Newry, 6 Miles from Armagh and 14 Miles from Portadown. If you are unable to visit please call or email us to Request A Quote for your home or commercial flooring needs, there's no obligation what so ever. What's more we will also be able to provide you with samples to help you make your final choice. Store opening hours and a map of the Armagh /Newry area are shown to your right. © Dalzells of Markethill - All Right Reserved.